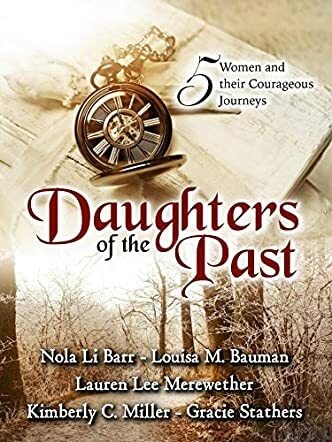 Daughters of the Past is an anthology of five short stories/novellas written by Gracie Stathers , Nola Li Barr, Louisa M. Bauman, Lauren Lee Merewether, and Kimberly C. Miller. Whilst each story is different, there is a common theme described by the authors as the courageous journeys of their protagonists, all women that have experienced trauma of one sort of another in their life journey. The stories include Rose, Lizzie, The Mitanni Princess, Esther, and Molly. Each story is well written, thought provoking, contains well developed and believable characters, and is written by each author with an empathy and emotion that brings each character to life. How I love an anthology where the reader can get lost in a story and absorbed in the characters, reach a satisfactory ending, even when tragic, and then have another to look forward to. Each one of these five stories has clearly been written by accomplished authors and each one is an enjoyable reading experience. Thanks go to these five authors for combining their writing skills and producing such a creditable piece of work. It should be noted that these stories feature five different women who face difficult decisions and triumph through adversity. In an age where equality is high on the agenda, this book in its entirety is an empowering work and one to be applauded. I have already mentioned that each story is thought-provoking, causing the reader to consider the issues raised, to relate to the central character and to almost will them on to a successful outcome. The title is perfect, the cover is eye-catching, and I hope that these five authors will get together for a second anthology of similar content.